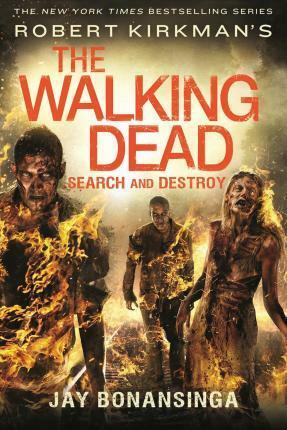 Robert Kirkman's The Walking Dead: Search and Destroy! The latest in Jay Bonansinga's New York Times bestselling series! For one brief moment, it seems Lilly and her plague-weary band of survivors might just engineer a better tomorrow. Banding together with other small town settlements, they begin a massive project to refurbish the railroad between Woodbury and Atlanta. The safer travel will begin a new post-apocalyptic era of trade, progress, and democracy. Out of nowhere, a brutal new faction has attacked Woodbury while Lilly and the others have been off repairing the railroad. Now the barricades are burning. Adults have been murdered, children kidnapped. But why? Why subject innocent survivors to such a random, unprovoked assault? Lilly Caul and her ragtag posse of rescuers will soon discover the chilling answers to these questions and more as they launch a desperate mission to save the kidnapped children. But along the way, the dark odyssey will take them into a nightmarish series of traps and hellish encounters with incomprehensible swarms of undead. And as always, in the world of the Walking Dead, the walkers will prove to be the least of Lilly's problems. It's what the human adversaries have in store for her that will provide Lilly's greatest challenge yet. JAY BONANSINGA is the internationally acclaimed New York Times bestselling author of over twenty books in fifteen languages, including Perfect Victim, Shattered, Twisted, and Frozen, with several optioned by major Hollywood studios. He lives in the Chicago area with his wife, the photographer Jill Norton, and his two teenage boys, and is currently hard at work on the next Walking Dead book.